Be the first to hear about their new releases and deals. Download the Booksprout app and search for RJ Beam today! My full time "day job" is in law enforcement. 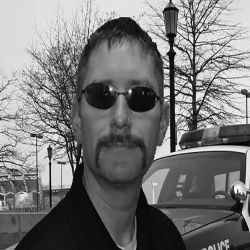 I first started as a police officer back in 1999. Like most cops, I started on patrol and have worked up the ranks in a variety of positions. For most of my career, I have been one of our department's evidence technicians. Some places call the job crime scene investigator or CSI. In addition to police work, I spent some time as a firefighter. As someone with both a fire and police background I find myself being the local de facto fire/arson investigator. Most folks would say CrossFit and books are my two primary hobbies. My enthusiasm for fitness has led me to get various coaching and personal training certifications. I don't have a regular coaching schedule but do train some people once in a blue moon. Outside of work, I am a father to two kids. Both of my kids are involved in Karate. However, when it comes to team sports my daughter plays soccer and my son is into baseball.